FEW WWI aeroplane designs would be subject to the continuous modifications and many experimental programmes of the Hansa -Brandenburg W 12 floatplane, yet all this fine-tuning paid off as these fighters proved highly effective in the hands of German Flanders-based Staffeln. 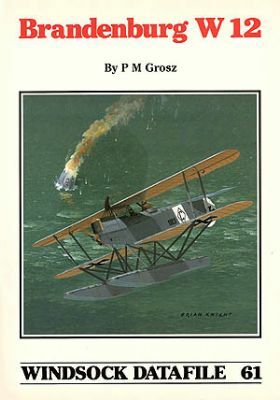 With their firepower and speed these aircraft were capable of taking on the big Felixstowe flying boats and at least two British scouting airships were lost,both directly and indirectly, as a result of attacks by Oblt.d. R. Friedrich Christansen,one of the German Navy's top fliers. The W12 saw widespread service in the North Sea and its history is related in detail by Peter M Grosz whose detailedstudy includes 45 archive photos, 10 close-ups and 14 pages of 1:72 and 1:48 scale drawings together with technical data on both short- and long- fuselaged versions.Comprehensive colour notes,three colour profiles and eight examples of personal markings are presented on the rear cover. Perfect reference for Wingnut Wings' W 12 kit. One of the KuK Kriegsmarine's most well-used large flying boats is meticulously described and illustrated by George Haddow who also provides the scale plans and rare archive images. The Winter issue of Windsock contains a mass of material that will inspire modellers and enthusiasts and set them up for a great New Year. Among the many highlights is a world exclusive preview of the new Wingnut Wings Felixstowe flying boats - the largest WW1 aeroplanes kits ever produced.